Hidden Treasures celebrates Hemmerle’s 125th anniversary and explores its heritage as medal makers. 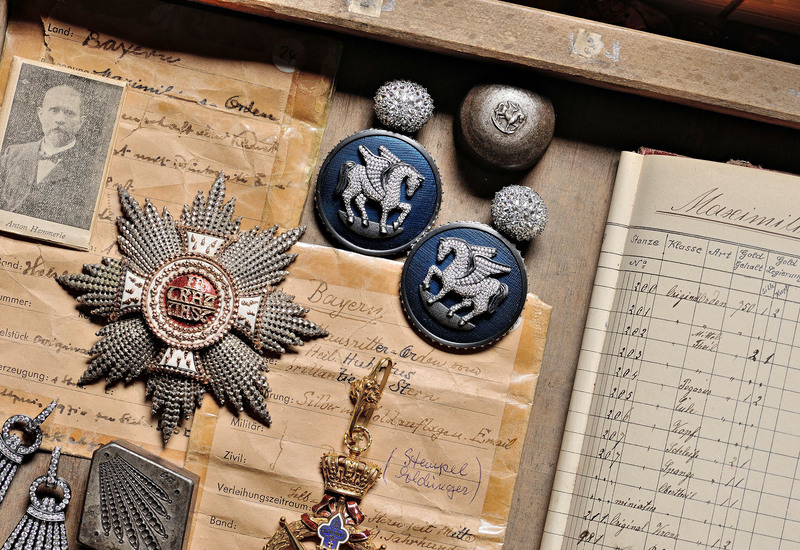 Hemmerle delved into the cellars of its Munich atelier to discover a treasure trove of embossing stamps within its rich archive once used to make various medals. 10 bold one-off pieces draw inspiration from the shapes and forms found, transforming them into contemporary works. 1893 The Hemmerle brothers, Joseph and Anton, acquire the sales premises and workshop of the Munich jeweller Elchinger on Augustinerstrasse. In taking over this goldsmith’s firm, whose speciality is making medals and insignia, they keep alive a tradition unbroken since 1796, in which both the business and the embossing tools used in medal production have been handed down from one family to another. The Bavarian royal house of the Wittelsbachs are among their clients from the start. 1895 The company is appointed supplier to the Bavarian royal court and Hemmerle remains the preferred creator of all medals in the Kingdom of Bavaria up until the end of the monarchy in 1918. Hemmerle also makes the Knight Grand Cross of the Royal Order of Saint Hubert, the oldest and most distinguished of all Bavarian orders with a tradition stretching back to 1444. At the beginning of the 20th century, the Hemmerle brothers become suppliers to the Vatican, producing almost all its Papal medals. Among these is the Order of Saint Gregory, inaugurated in 1831 by Pope Gregory XVI. From 1905 on, Hemmerle is responsible for the creation of the Bavarian Maximilian Order. Initiated by King Maximilian II of Bavaria in 1853, the order is awarded for exceptional achievement in science and arts. In 2018, Hemmerle commemorates its 125th anniversary with Hidden Treasures that draws inspiration from the company’s origins and the tradition of medal creation. Hundreds of ancient embossing stamps lie in the vaults of the atelier. Aureoles, laurel wreaths, oak-leaves, star rays, crowns, crosses - the shapes stand out in delicate outline from the positive and negative forms of their iron embosses. The embossing stamps are an inspiration for a thoroughly contemporary series of jewellery creations. Antiquities, pebbles and acorns are set in Hemmerle creations with the same reverence as emeralds, sapphires and diamonds. Equally, a single star-shaped element from a former ceremonial badge re-emerges, in modern re-interpretation, as an abstract expression of noblesse.